Where is The Lost Boys filmed? This 'fang-in-cheek' horror comedy follows the arrival of a one parent family headed by the mother, Lucy Emerson (Dianne Wiest) and her two sons, Michael (Jason Patric) and Sam (Corey Haim) as they move into their grandpa's (Barnard Hughes) Santa Clara house after a bitter divorce left them with nothing. Santa Clara is a tourist seaside resort which attracts a great many young people to its all night fairground and beaches. Like all seaside resorts it has a delinquent juvenile element and is plagued by bikers and a great many unsolved disappearances of people which gives the place its nick-name "Murder capital of the World". 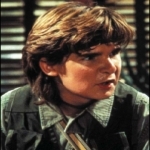 Sam the youngest of the two brothers, makes friends with two brothers called, Edgar (Corey Feldman) & Alan Frog (Jamison Newlander) who claim to be vampire hunters. Michael, on the other hand, meets a beautiful girl called Starr (Jamie Gertz) at the local amusement park. Starr soon introduces Michael to her 'friends'; David (Keifer Sutherland), Paul (Brooke McCarter), Dwayne (Billy Wirth), Marko (Alex Winter) & Laddie (Chance Michael Corbitt). After a brief initiation, the 'boys' invite Michael back to their 'home', which is a derelict Grand Hotel destroyed in a past earthquake. Here, Michael takes part in a ritual which leaves him hankering after sleep during the day & becoming increasingly photophobic and a hunger he just can't suppress, the classic signs of vampirism. Fearing for his own safety Sam recruits the help of his two young friends in helping him save his brother from the clutches of the vampires, and to do this they must find the head vampire. But who could it be? Lucy's new boss/boyfriend Max (Edward Herrmann), David, Paul, Dwayne, Marko, or could it even be Laddie?